The ever-popular Pappadum is a delicious traditional crispy snack that is served either as an appetiser or with a main meal. 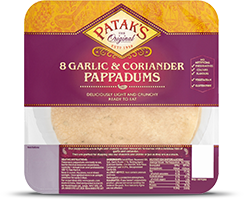 Our Patak's Garlic Coriander Pappadums are made using traditional processes and have a wonderful authentic taste. Tasty by themselves, they are even better when dipped into a chutney, pickle, raita or curry. May contain peanuts and nuts. No artificial preservatives, colours, flavours. Vegetarian. Gluten free. Lentil Flour, Rapeseed Oil, Salt, Garlic Purée (3%), Raising Agent (Calcium Oxide), Coconut Oil, Rice Flour, Coriander Leaf (0.5%), Encapsulated Garlic Oil. Looking for the ultimate comfort dish? Try this recipe combining paprika, cumin and coriander with tomatoes and lentils. Our Balti Spice Paste transforms humble lentils into a delicious dinner. These Lamb Keema Paos are our favourite guilty pleasure. Full of flavour, tang and spice from our Rogan Josh Spice Paste - they will not disappoint! This tasty chicken sensation is sure to be your new dinner time favourite. Indulge in this delightful chicken and spinach dish using our Tikka Masala Paste Pot, the perfect fresh and aromatic flavour boost.